Björn was born a while ago. Him and I have had the pleasure of spending many days together, getting to know each other, voicing our dreams, our stories, our likes and dislikes. I feel like I know him pretty well, like I've known him all my life. So, with that in mind, I will let you know a little bit more about him. He is by the way, a lovely fellow (just don't ever call him lovely, to his face, or pretty either, he gets very cross!). Björn was born (or so he says, as I know otherwise), in a sea village. The pungent smell of the salty sea foam rocked him to sleep as a baby, the sounds of iron and ocean, of birds and laughter, are deeply ingrained in his personality. He can be quiet and mild, like the flight of a sea gull, or boisterous and happy like a frenzied sea. His love for ships is probably only surpassed by the love for his people. He is helpful, kind, intrepid and very brave. He loves to pretend and enact the future battle of Ragnarok. It is his favourite pretend play. He figures that he will turn the tables, and aid the Gods against the giants and evils of the world, and he will be rewarded with a trip through the Bifrost. His biggest dream. So you will find him, most of the time, with shield and hammer in hand, yelling all sorts of insanities, directing battles here or there, hiding behind a chair or pail, waiting for his time to subdue that mean and old dwarf who is coming to get him. It is a joy (with a dash of dismay and fear), to watch him so deep "in battle"; so enraptured by his imagination, so concentrated, and so happy. He really glows when he plays. He comes back sweaty and joyful, hungry and tired. We feed him, clean him, and put him to sleep. Björn, as you have probably deciphered by now, is a Viking. 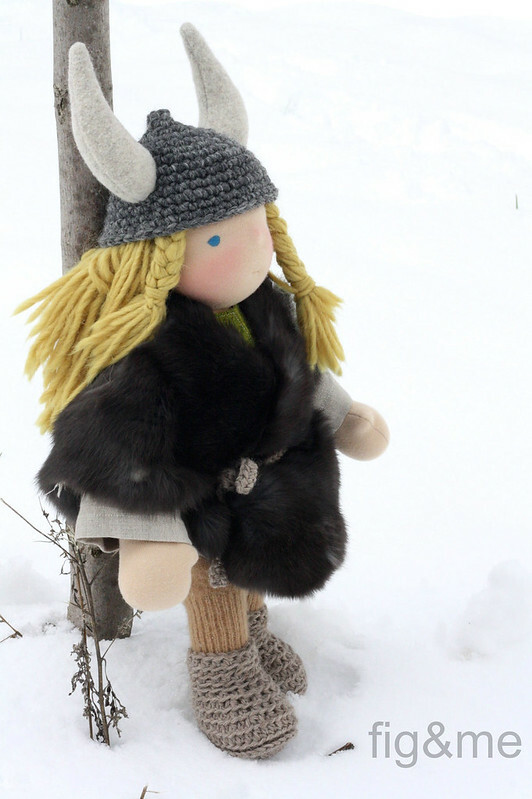 He was created with this culture in mind, and although I have created wee vikings before, I truly believe this is a true viking (although his horned helmet is obviously not a true viking fashion, we just had to do it!). He has told me so. He is part of a small group of dolls, which we call Ancient Warriors. 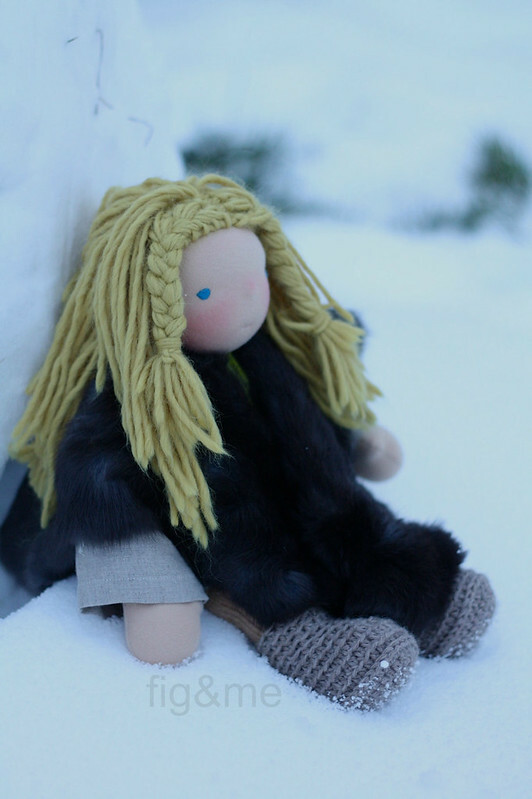 Dolls that will hopefully spark the imagination of your loved ones, that will bring a little bit of magic into your life. I believe Björn is full of magic. He seems to embody not only a little of that scandinavian joy of life, but also the love for play. I wish I could play with him forever, but his time has come to find his own home. 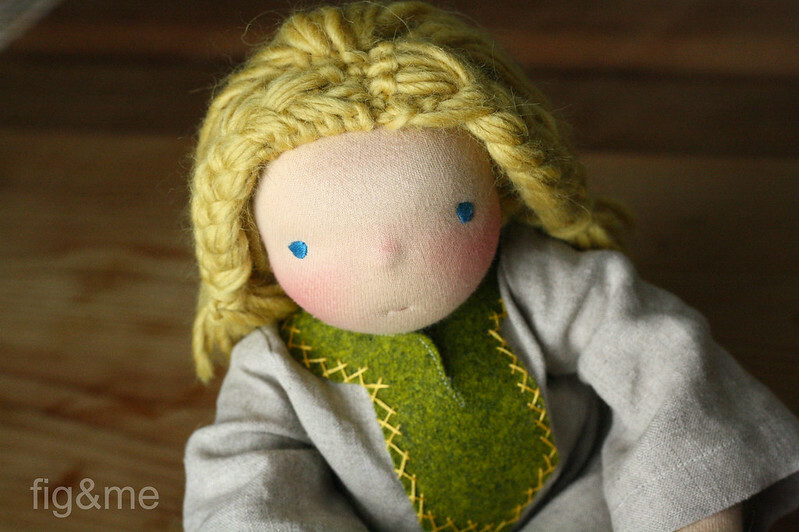 This doll is made with all natural materials, as it is our custom and aim in this toymaking adventure. He is stuffed firmly with wool, and is made of cotton. He is firmly sewn to withstanding rough play, and his hair is made of llama and wool fibers. His clothes, albeit simple in design, speak of his culture: a linen tunic with wool felt details and embroidery stitches; his cashmere leggings (those winters can be cold), and his wooly boots; his helmet, also made of wool and melton cloth; and his fur coat, made with a rabbit pelt. 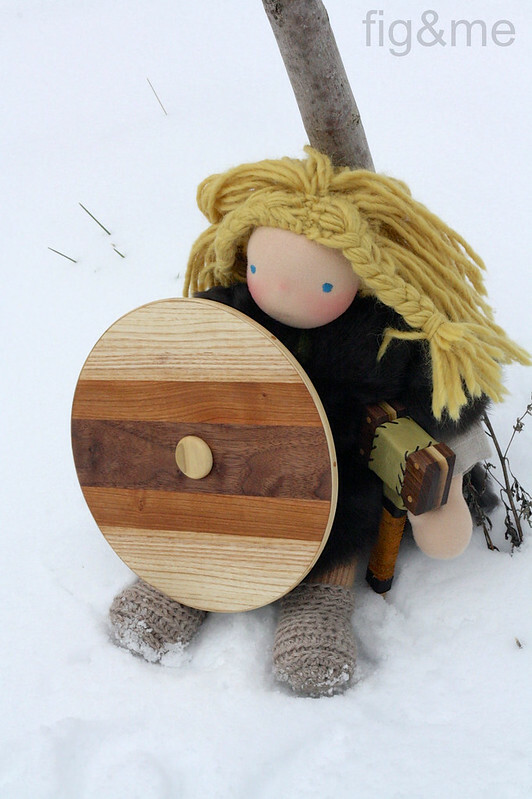 His wooden weaponry was made by my husband Derek, who has a long history of viking infatuation. 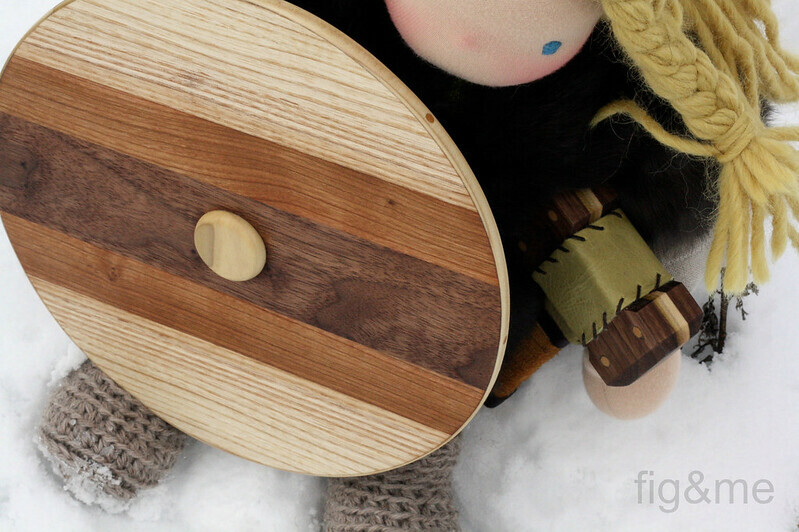 He lovingly made him a wooden round shield, and a mighty hammer. Both trimmed with leather. The weapons are coated with natural materials (no varnish), and the leather was dyed with water-based natural dyes. The shield and hammer have been laminated with different woods to give a simple yet elegant design: walnut, cherry, ash and poplar. The construction of these weapons involved many trials and many hours in design and execution, to make them sturdy, natural and beautiful. I am so marvelled and humbled by what my husband has created for this group of dolls, that the excitement almost sent me over the edge. I am so happy to finally be able to share them with you. 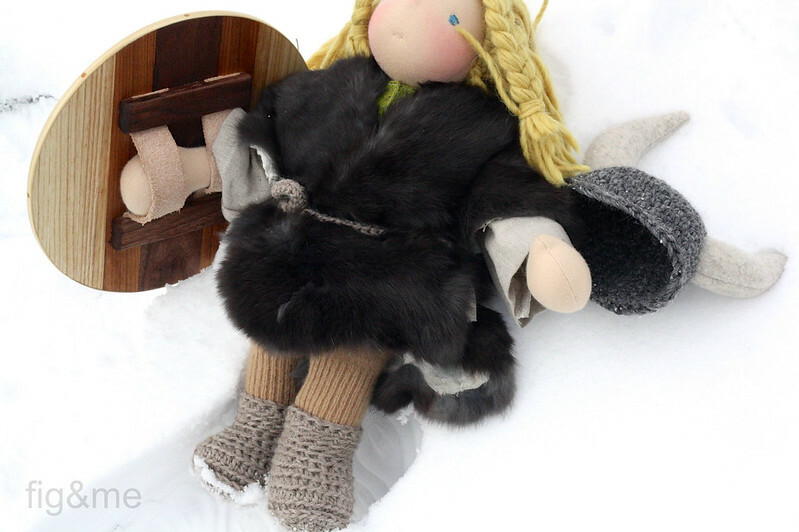 Björn is a 14"(36 cms) tall doll, who would be more appropriate for a child 4+. 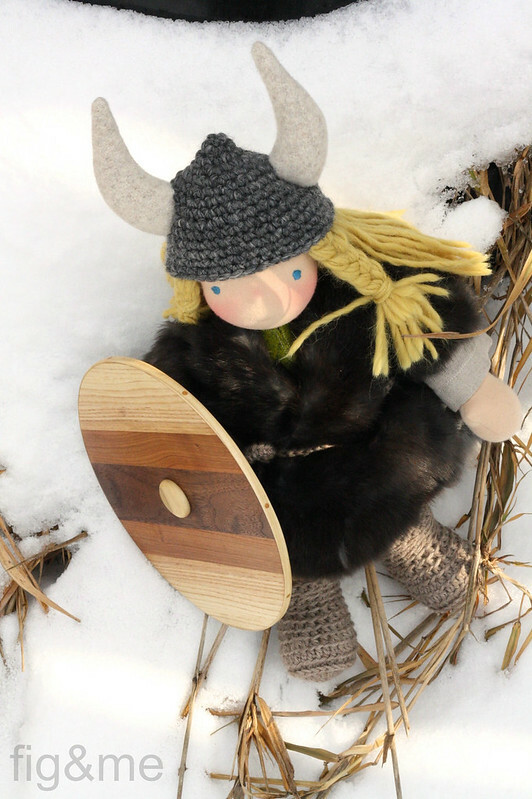 A boy or girl that engages in this kind of games, who spends hours in deep and concentrated pretend action, and who would love to play with a little viking. We are sure someone out there would love these toys, and would cherish them in their life (we hope so!). If you are interested in welcoming this charming fellow into your home, please leave a comment in this post, and we will (very excitedly) choose a name on December 1st, at 10:00 PM EST. The price for Björn and all his toys, is $320 USD plus postage charges. Thank you for reading about him, and for considering taking him home. Good luck!! to read about him, and to those that offered to be his new family. Three more boys to go!